Many months ago we made an interesting call in Palladium and alerted to this setup on January 24th, 2018. 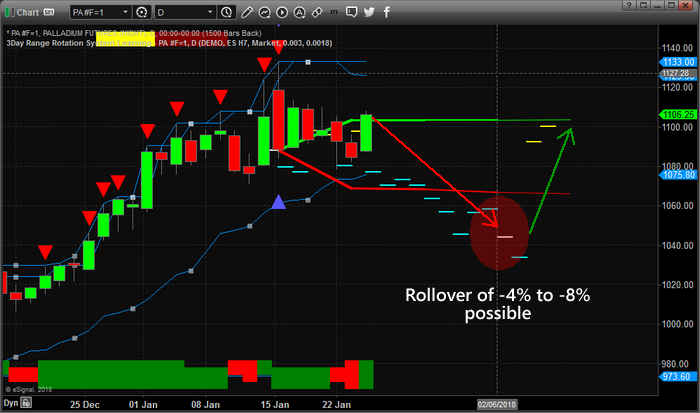 This nearly perfect call included our future price expectations using our advanced ADL price modeling system. Today, we are refreshing that call with a new market call to inform you that our price prediction has played out perfectly and it has completed its pullback. Last January, we identified this critical double top in Palladium and warned our followers that a 4~6% price correction was about to unfold. At that time, this chart below showed our predictive price analysis and warned that prices would retrace in price. This type of setup/move is a simple technical trade. In short, when price of an asset has had a substantial move and reaches a clear resistance level like this, you must expect sellers to step in and unload their position to lock in profits. This, what was drives the price lower temporarily. This next chart below is the current daily Palladium price showing the upside price breakout that has recently caught our attention and the reason why we are alerting our followers to the upside potential of this move. We have been long the metals markets for quite a while and this upside breakout in Palladium may be the start of a massive upside move in the metals. Our recent research shows that the precious metals markets may be setting up for a solid upside price rally with the Syria event and other recent news. 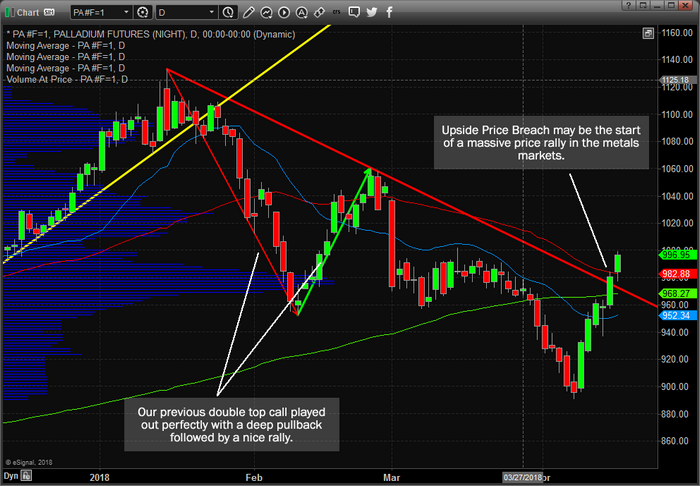 Have You Seen Palladium’s Tradable Price Pattern?